This month at Gray’s we have an extensive number of fine works on paper, rare books, and illuminated manuscripts up for auction, including an impressive collection of fine editions from the Print Club of Cleveland. Starting off the auction in Lot 1 is a print of St. George and the Dragon, 1947 by Salvador Dalí (1904-1989). While the world-renowned surrealist arguably needs no introduction, many art collectors may not realize that Dalí had an extensive history with the city of Cleveland through his patrons Reynolds and Eleanor Morse. Reynolds Morse was a successful local businessman who first encountered Dalí via a retrospective on March 21st, 1943 at the Cleveland Museum of Art. Morse attended with his soon to be wife Eleanor and the couple was immediately infatuated with the artist’s style and subject matter, purchasing their first piece of his that day, called Daddy Longlegs of the Evening – Hope! They became diligent collectors of Dalí’s work, going on to form a friendship with the artist and his wife Gala and becoming some of his foremost patrons. Eventually they became his de-facto curators and the foremost historians of his oeuvre. By 1971, the couple’s collection had grown so extensive that they converted a wing of their business grounds into the Salvador Dalí Museum, which was housed in Beachwood, Ohio until 1980, at which point the collection had grown so considerably large as to necessitate a new and permanent home. After receiving a sweetheart deal from local officials, the museum was moved to St. Petersburg, Florida, where it remains to this day. Still, the Dali museum left an indelible mark on Cleveland’s art scene, and prints of the artist’s works often come up for auction at Gray’s. St. George and the Dragon, 1947 is one of Dali’s most recognizable lithographs, depicting the famous Christian legend, which Dali revisited many times, first as a painting completed in 1942, then as a sculpture completed in 1947 and finally the subject of many lithographs. In Lot 2 is a lithograph Summer Benediction, 1953 by Charles Ephraim Burchfield (1893-1867). A visionary artist known chiefly for his moody and hallucinatory watercolor paintings, Burchfield was raised in Salem, Ohio and most of his early works were created in this house, where he lived from the age of five to twenty-eight. In 1916 Burchfield graduated from the Cleveland Institute of Art under the leading watercolor artist Henry George Keller. After getting engaged to Bertha Kenreich in 1921, Burchfield moved to Buffalo, New York, where he balanced his painting with fatherhood and a job as a designer for the H.M Birge wallpaper company. In 1928, he made the leap to painting full time by approaching artist Frank Rehn to ask if he could sell his pieces through his gallery in New York City. Fortunately for Burchfield, his works continued to sell through the Great Depression, and by 1954 he was an esteemed veteran painter, elected as a full member into the National Academy of Design. Like many of Burchfield’s pieces, Summer Benediction depicts a hazy and mystical nature scene, almost dreamlike with a wavy contour and deft use of shading. Lot 3 is a print of Approaching Storm, 1938 by Thomas Hart Benton. Born in Neosho, Missouri to a four time US congressman, and named after his great uncle, one of the first two senators ever elected from Missouri, Benton was initially groomed for a political career at a young age. With his mother’s support, Benton decided instead to pursue his interest in art, enrolling at The School of the Art Institute of Chicago in 1907. In 1909 he moved to Paris to continue his education at the Académie Julian. Benton served in the US Navy during WWI, and while his family connections kept him away from the frontlines, he was able to use his artistic skills as a shipyard scene painter and camofleur at his base in Norfolk, Virginia. In addition to his encounters in Paris with contemporaries like Diego Rivera and Stanton Macdonald-Wright, Benton’s work for the navy had a profound impact on his style, and he returned to New York after the war as a newly declared “enemy of modernism”. Benton cultivated a vivid naturalistic style now known as Regionalism, depicting scenes of everyday life in a swirling and almost musical style influenced by his friend Stanton Macdonald-Wright’s synchromism. Benton found his first big break as a muralist, commissioned to paint murals of Indiana Life for the 1933 Century of Progress Exhibition in Chicago. Benton went on to prestigious career as a painter, muralist, an educator, writing an acclaimed autobiography called An Artist in America in 1937. He often courted controversy for his outspoken political beliefs, advocating for working people and including allusions to America’s race problem in his murals. He eventually alienated himself from the New York arts scene, pushing him to find his true muse in the vast expanses of rural America, as can be seen in the ominous and melancholy Approaching Storm. Lots 4 and 5 contain two pieces by Lyonel Feininger (1871-1956): a lithograph called Off the Coast, 1951 and a woodcut called Gelmeroda, 1920 respectively. A German-American expressionist who was born in New York but was educated and spent most of his adult life in Germany, Feininger initially began his artistic career as a caricaturist and comic strip artist for The Chicago Tribune, where he became known for his strip “The Kin-Der Kids”. Feininger eventually transitioned to fine art at the age of 35, joining the Berliner Sezession in 1909 and becoming associated with other leading German expressionist groups. When Walter Gropius founded the Bauhaus in 1919, Feininger was the very first artist that he appointed to the faculty, and he taught there for several years, designing the cover for their manifesto. When the Nazis took power in 1933, Feininger was forced to flee back to America after his art was declared “degenerate”, and he spent the remainder of his life there. Two of his sons, Andreas Feininger and T. Lux Feininger went on to become noteworthy artists in their own right. 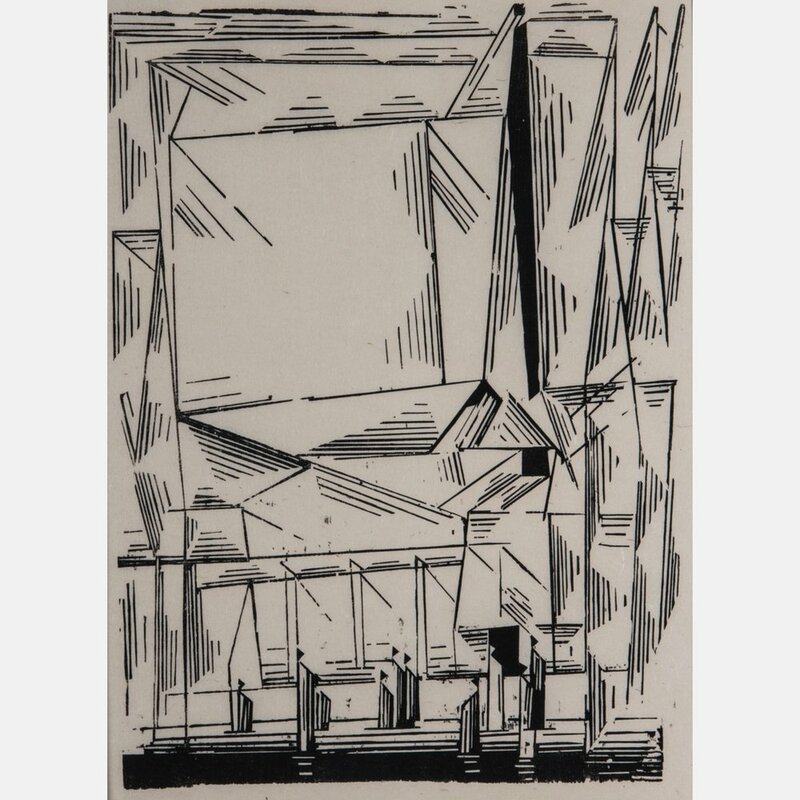 Feininger’s unique expressionistic style, with its hard angles and fragmented light, brings to mind a softer futurism or cubism, finding a kind of warmth in the midst of jagged abstractions, as seen in the two prints up for auction at Gray’s. 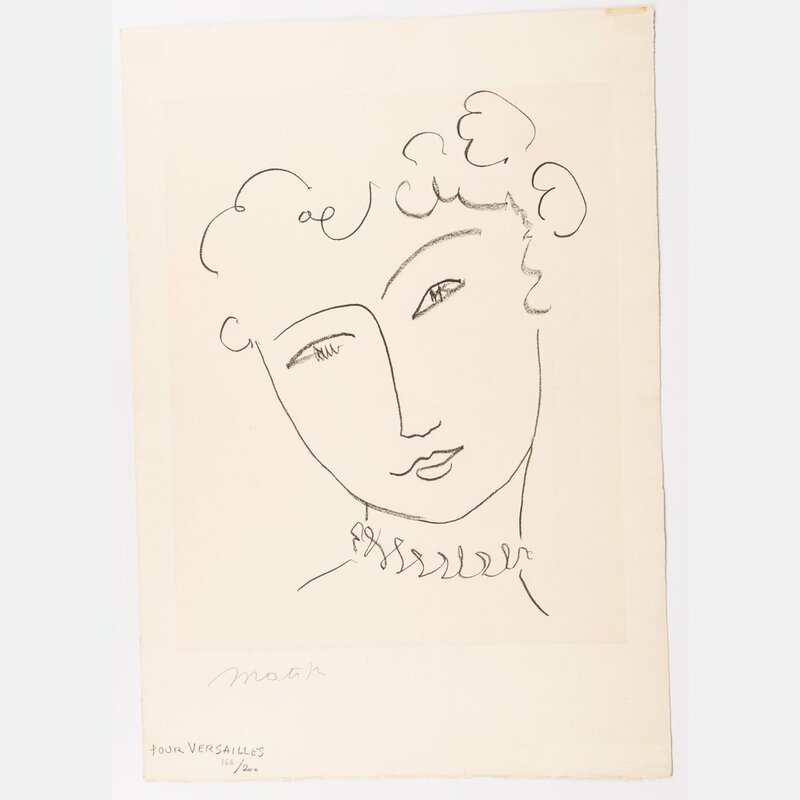 Also up for auction this month are 3 pieces by the revolutionary French painter Henri Matisse (1869-1954). Considered one of the true luminaries and innovators of modern art in the early twentieth century, Matisse did not actually start painting until he was twenty years old when his mother brought him art supplies while he recovered from appendicitis. Falling in love immediately, he abandoned his law studies and began studying art at the Académie Julian in 1891 under such teachers as William-Adolphe Bouguereau and Gustave Moreau. Matisse eventually found his greatest inspirations after being exposed to the colorful impressionism of Vincent Van Gogh and Paul Cézanne, experimenting with these influences and others through the turn of the century until he developed a style of flat expressionistic shapes and vibrant color that came to be known as Fauvism. He expanded the limits of what was possible with color and form in modern art, and his influence cannot be overstated. Lot 6 is Pour Versailles (From La Pompadour), 1951, Lot 7 is La Vierge et L'Enfant, CA. 1950/1951 , and Lot 8 is L’Espagnole a la Mantille, 1925. 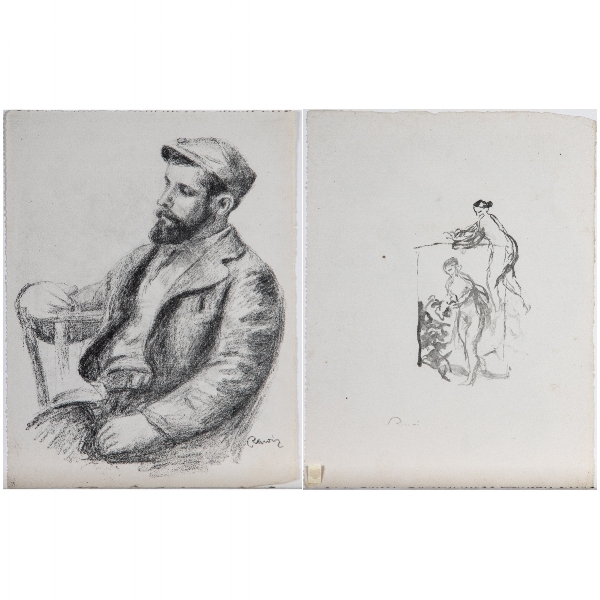 Gray’s will also have 3 lithographs this month by the equally legendary French impressionist Pierre-Auguste Renoir (1841-1919): Louis Veltat in Lot 9, La Pierre au Trois Croquis in Lot 10, and Claude Renoir, La Tête Baisée in Lot 11. Initially trained as a singer, the financial hardships of his family forced Renoir to give up his musical lessons and take a position at a porcelain factory at the age of 13. While he quickly learned to despise his work, it helped him to cultivate his natural talent for drawing and drove him to frequently roam the halls of the Louvre near where he lived as a means to escape the drudgery of working life. His supervisor at the factory took notice of this innate talent and encouraged Renoir’s family to help him pursue an education in the arts. In 1862, he began tutelage in Paris under Charles Gleyre. It was there that he first met Claude Monet, and the two would develop a lifelong friendship and artistic partnership, making similar inquiries into light and color as they became the leaders of the greater Impressionist movement. Renoir was often penniless and struggled to find financial security from his paintings but by the end of the 1870’s, had become successful, prolific, and fashionable, and is now recognized as one of the seminal figures in the development of modernist aesthetics. Renoir painted several thousand paintings in his lifetime and is known for his luminous use of color and deft brushwork, and the unique warmth and sensuality that he brought to his portrait work, particularly of female subjects. Gray’s also has a number of etchings by Frank Weston Benson (1862-1951): The Punter, 1927, in Lot 15, Turnstones, 1928, in Lot 16, Rainbow Cove, 1927, in Lot 17, and Evening Flight, 1927 in Lot 18. Benson was a contemporary of Renoir and Monet’s and derived great inspiration from them in developing his own contributions to the American school of Impressionism. Coming from a privileged upbringing in Salem, Massachusetts, Benson spent his youth exploring the countryside sailing, fishing, and hunting. He cultivated a lifelong love of nature and as a teenager began painting landscapes and ornithological paintings, taking after his mother. He attended the Académie Julian 1883 and found near immediate success in Europe, traveling across the continent to see exhibitions of his own work and spending time painting in England, Dublin, Italy, Belgium, Germany, and Brittany. Returning to the United States in the 1880’s, Benson established himself as an educator, first with the Portland, Maine School of Art and then with the School of the Museum of Fine Arts in Boston. A master of light and color, Benson produced some of the most achingly beautiful landscapes and portraits of any American painter, and was a foundational figure in America’s burgeoning art scene in the late 19th century. Gray’s has an extensive collection of etchings this month by American artist James Abbott McNeil Whistler (1834-1903). Another painter known for his striking sense of realism and masterful technique, Whistler was prone to mood swings and violent tempers as a young boy until his parents found painting to be the one activity that soothed him. In 1842 Whistler's father was summoned to St. Petersburg by Tsar Nicholas I to design a railroad, and the family resettled to Russia. It was there, in 1845 at the age of 11, that Whistler enrolled in his first formal art instruction at the Imperial Academy of Fine Arts. Four years later, Whistler was forced to cut his education short when his father died of cholera and the family settled back in the United States in Pomfret, Connecticut. His family’s dire financial situation led Whistler’s mother to dissuade him from continuing to pursue the arts, first nudging him toward training to be a minister, before enrolling him in the military academy at West Point. Shortly thereafter, he was expelled for his rambunctious behavior and poor grades, but he had acquired enough knowledge of mapmaking to acquire a job as a topographical draughtsman. In 1855, at the age of 21, Whistler left for Europe to pursue an artistic career, and never returned to the United States again. Spending time and quite a bit of money as a bohemian socialite while studying in Paris and then London, Whistler eventually fell in with French painter Henri Fantin-Latour and through him met Realist painters Gustave Courbet, Alphonse Legros, and Édouard Manet, as well as the poet and art critic Charles Baudelaire. This cadre’s grasp of realism and modernity deeply influenced Whistler, who developed a moody realistic style, later incorporating influences from the burgeoning Impressionist movement and Japanese painters. While he developed a great reputation as a painter and wit, his temper and combative personality fractured many of his close relationships and turned many critics against him. He was deeply defensive of his work, and while his stylistic contributions are not in doubt, his contributions to attitude and ethos have been just as influential on later artists. We have 17 of his pieces this month at Gray’s, including lots 19, 20, 21, 22, 23, 24, 25, 26, 27, 28, 29, 30, 31, 32, 33, 34, & 35. Also up for auction this month are a number of Illuminated Manuscripts from the collection of Otto F. Ege, dating from the 13th through the 16th centuries. Coming chiefly from the middle ages, Illuminated Manuscripts are manuscripts, typically written on vellum, that have been decorated with painted lettering or pictures, and are sometimes even inlaid with gold or silver, from which the term “illuminated” originates. Illumination was a way for medieval scribes to make important texts legible to both the masses and to a ruling class which was largely illiterate in Latin, the language in which these holy texts were transcribed. They are also the best surviving specimens of medieval painting, and the best preserved. Indeed, for many areas and time periods, they are the only surviving examples of painting. We have 21 Illuminated Manuscripts up for auction, including lots 70, 71, 72, 73, 74, 75, 76, 77, 78, 79, 80, 81, 82, 83, 84, 85, 86, 87, 88, 89, and 90. This month’s auction also features a section of rare books, including first editions of classic Victorian Novels. 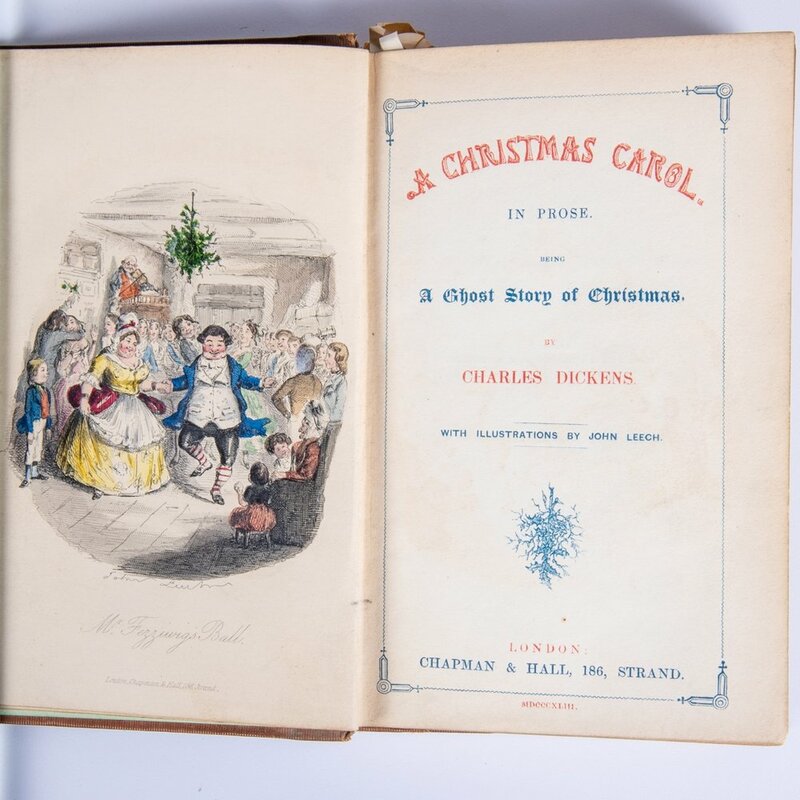 Just in time for the holidays, Lot 110 contains a first edition printing of Charles’ Dickens beloved masterpiece, here listed with its original title: A Christmas Carol in Prose, Being a Ghost Story of Christmas. (1843), including original illustrations by John Leech and printing mistakes included in only the first release. Also up for auction is a first edition of L. Frank Baum’s classic allegorical fairytale The Wonderful Wizard of Oz (1900), with original illustrations by W.W. Denslow in Lot 145, and a 1935 limited edition printing of Edgar Alan Poe’s Tales of Mystery and Imagination signed by the illustrator Arthur Rackham in Lot 125. The final book we would like to highlight is Lot 91, John James Audubon’s The Birds of America, From Drawings Made in the United States and their Territories. Consisting of 435 hand-colored, life-size prints, made from engraved plates, measuring around 39 by 26 inches (99 by 66 cm). It includes images of six now-extinct birds: Carolina parakeet, passenger pigeon, Labrador duck, great auk, Eskimo curlew, and pinnated grouse. The book was originally released as a series of copperplate etchings, five at a time, every 2 to 5 months, to wealthy subscribers. Only 120 full copies of this original set are known to survive, and in December 2010, The Economist magazine estimated that, adjusted for inflation, five of the ten highest prices ever paid for printed books were paid for copies of Birds of America. Produced after the original folio edition was completed, Audubon published the work as a smaller and more affordable seven volume Royal Octavo edition, now up for auction at Gray’s. For any collector of fine art, literature, or historical texts, our November auction is a celebration of these arts and more. Take a look through our full catalog, available now online.